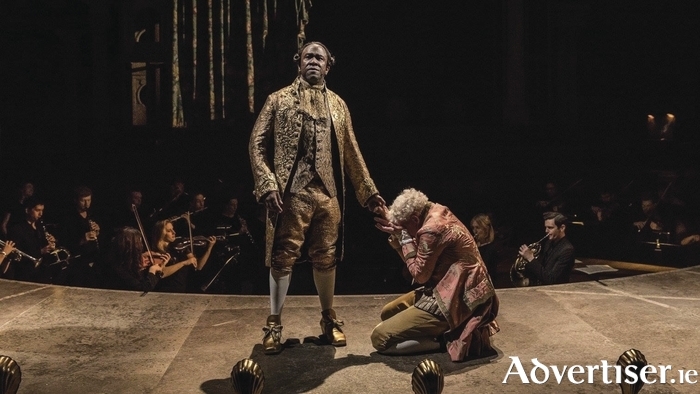 LUCIAN MSAMATI, who has starred in Taboo, Game Of Thrones, and Luther, takes on the role of Mozart in an acclaimed new production of Peter Shaffer’s iconic play, Amadeus, which will be broadcast live to The Eye Cinema in Galway. Wolfgang Amadeus Mozart, a rowdy young prodigy, arrives in Vienna, the music capital of the world, determined to make a splash. Awestruck by his genius, court composer Antonio Salieri has the power to promote his talent or destroy his name. Seized by obsessive jealousy he begins a war with Mozart, with music, and ultimately, with God. This production of Shafffer's play is being staged by Britain's National Theatre, with live orchestral accompaniment by Southbank Sinfonia. It will be broadcast to The Eye on Thursday February 2 at 7pm.